Wiley Post was an accomplished American aviator, and the first to fly a fixed-wing aircraft around the globe in 1931, setting a record time of 8 days, 15 hours, and 51 minutes. Interestingly, the first around the world flight was made by Hugo Eckener in 1921, piloting the Graf Zeppelin and taking 21 days. In 1933 Post repeated his flight, this time flying solo, and breaking his previous record with a time of 7 days, 18 hours, and 49 minutes. His plane, the Winnie May, is now on display at Smithsonian’s National Air and Space Museum. 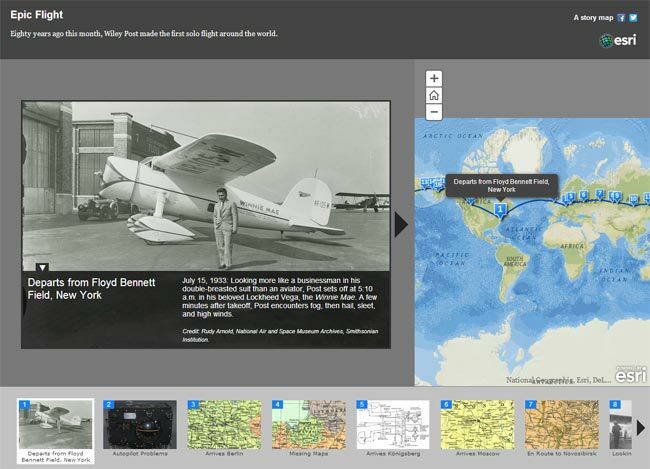 You can learn more via an Esri story map that commemorates the 80th anniversary of Post’s feat by visiting the Smithsonian’s Air & Space website, or viewing the story map application. Visit Storytelling with Maps to view more interesting story maps from Esri and the ArcGIS community.